By leveraging upon our extensive market knowledge, we provide the best array of 5 Gallon Metal Bucket. 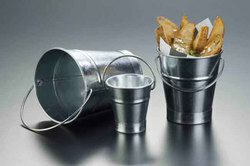 This galvanized pail with long handle is great for everyday gardening or for showing off your plants at special events. It comes with Galvanized liner and features a metal handle. The pail is coated in zinc to protect it from rust and Powder Coating inside to give it two tone matching. Size: 16 " to 26 "
Aluminium Bucket with polish finish. 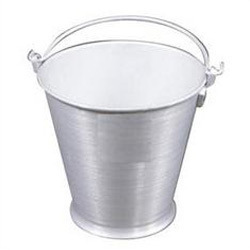 Galvanized Iron Buckets with Handle. We are offering varieties of Metal Garden Buckets. Iron Black Waterloo Bucket, Size: 13"
Samrat Aluminium Milk Buckets are durable and well smooth quality product. We are one of the top Aluminum Utensils Manufacturers and Suppliers of Eastern India.